The Algarve is booming. Not only is it attracting more tourists, there are also more people buying and renting homes here. Business is improving so much that several hotels no longer plan on closing for the winter, and the list of optimistic forecasts goes on. If expectations were already high for what’s to come in 2016, they are definitely soaring now. National newspapers have reported the good news, predicting “all-round growth” for the Algarve, mostly the region’s “hotel and real estate sectors”. The success of this Easter season is only adding to the excitement. 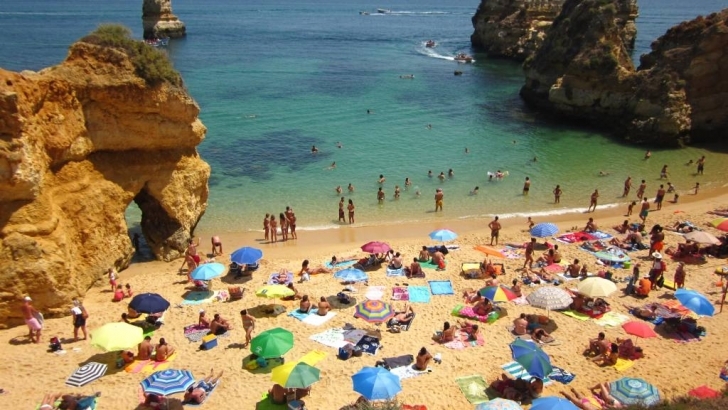 “When Easter is in March, there is usually less demand in the Algarve as it’s normally too early for beach weather, but this year we registered a 5% increase (in hotel room bookings),” said hotel association (AHETA) president Elidérico Viegas. He added that “reservations for this summer are already 30% above what they usually are at this time of year”. But perhaps even more important is that reservations are already being made for as late as November – a time when several hotels in the Algarve have usually already closed for winter. “This year there will be more hotels that won’t close, or will close for smaller periods,” regional tourism boss Desidério Silva told Expresso. The Vila Galé hotel group, for example, has already reduced its winter break to “no more than two months”. “We’re riding the crest of a good wave and already have reasonably good business scheduled for between May and October,” Vila Galé administrator Gonçalo Rebelo de Almeida said. While tourism officials are investing heavily in promoting the Algarve in places like Spain, France, Germany and Holland, the region is also benefiting from the distrust that big tour operators, such as TUI and Thomas Cook, feel towards places like Turkey, Egypt and Tunisia. Many of these North African and Middle Eastern countries have lost appeal due to dangerously high threat levels. “Tour operators are making big cancellations and looking to safer and more traditional European destinations like Portugal and Spain,” explained António Trindade, CEO of Porto Bay Hotels & Resorts. This means the Algarve will receive not only more tourists in the summer, but also in ‘sleepier’ months such as March, April, May, October and November. Some hotels and resorts have already decided to remain open all year with great results. Bela Vista Hotel & Spa in Praia da Rocha, Portimão did not close for winter and saw revenue increase a significant 27%, reports Expresso. Also enjoying more successful times is the Algarve’s real estate sector. According to Público newspaper, the number of people interested in renting a holiday home in the Algarve is “20% to 25% higher than expected” while prices are gradually recovering. “And we’re not even offering special deals, like in previous years,” said Reinaldo Teixeira, CEO of Garvetur real estate company. The newspaper adds that events like the Vilamoura Atlantic Tour, the popular horse riding competition, have not only brought more tourists to the Algarve but have also encouraged some to buy homes here. “I just heard that a horse rider bought a home here,” said António Moura, the head organiser of the Vilamoura Atlantic Tour. Further along the Algarve, the Carvoeiro office of estate agents Fine & Country also has encouraging news. “Compared to last year, the number of enquiries from potential buyers in the first quarter more than doubled,” said property manager Patrícia Candeias. Even hoteliers like Jorge Beldade, the head of the Tivoli hotel group in the Algarve, are happy about the recovery of the property market. Whether all these optimistic forecasts will come true remains to be seen, but what is certain is that the Algarve seems set to break at least some of the impressive records it set just last year.